Caveat Suffragator – Let the voter beware. When measuring the top GOP contenders in terms of eligibility under the U.S. Constitution, if I had to choose between the two, I have to admit that I am more inclined towards Gingrich than Romney. Like Mitt Romney, I too was born in Detroit, Michigan, but that’s where the similarities end. My parents and grandparents were all born in the State of Georgia, while Romney’s father was born in Mexico. In contrast, Gingrich’s parents and grandparents, like himself, were all born in the State of Pennsylvania. So when it comes to the question of natural born citizenship, Gingrich clearly passes the test, while Romney’s qualifications are uncertain at best. I don’t believe that because Obama was somehow able to skirt the issue, that Romney, and everyone else who follows, should simply be given a pass. Since we learned the last time around, the issue, as it seems, is more in the hands of the voting public than the courts, it is only fair that we know the facts, and make an informed decision. When Mitt Romney’s father, George W., made his presidential bid in 1967, questions were occasionally asked about his eligibility to run for President, due to his birth in Mexico, and given the ambiguity in the United States Constitution over the phrase “natural-born citizen”. But although questions regarding his presidential eligibility arose, the issue of his status as a U.S. Citizen was never fully addressed. The New York Times article, Celler Suggests G.O.P. Name Group to Investigate Romney’s Eligibility, published on May 15, 1967; lead off with, “Representative Emanuel Celler expressed “serious doubts” as to whether Gov. George Romney of Michigan is eligible for the Presidency.” On June 14, 1967, an essay entitled “Natural Born Citizen,” by the Hon. Pinckney G. McElwee of the Bar of the District of Columbia, was entered into the Congressional Record by Texas Representative, Mr. Dowdy. It was written more in the context of a possible candidacy of Governor George Romney (born in Mexico) for president, than regarding his citizenship. George Romney formally announced his withdrawal as a presidential candidate on February 28, 1968. The addition of a grandfather clause in this paragraph says a lot as to the meaning of natural born. 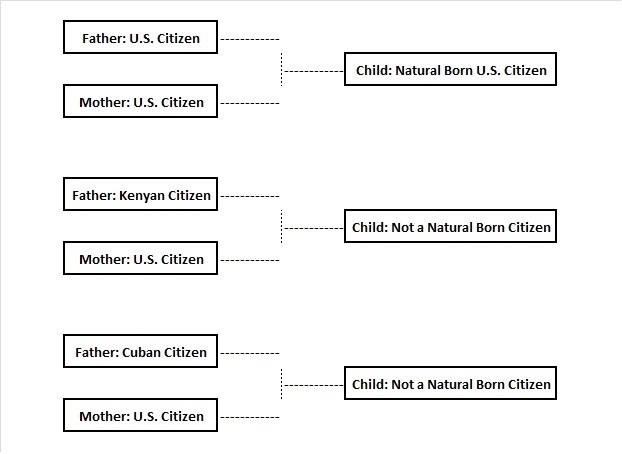 The first thing it says is that being born in the U.S. is not enough to be natural born; otherwise the grandfather clause would not have been necessary. The writers and delegates, having been born in the United States, wanted to be eligible for the presidency, but most were the children of British subjects. Knowing that this eliminated them from being natural born, and thus ineligible, they included the grandfather clause, which expired when the last person alive at the time of the ratification of the Constitution died. So, being a native born citizen is not the same as being Natural Born, for if it were, the framers would not have included the clause. Newton Leroy Gingrich was born on June 17, 1943, in Harrisburg, Pennsylvania. His mother Kathleen Daugherty and father Newton Searles McPherson divorced soon after Newt was born. Kathleen remarried to an Army officer named Robert (Bob) Gingrich, who adopted Newt at the age of 3. Gingrich has three younger half-sisters, Candace, Susan, and Roberta. Growing up, the Gingrich family moved around frequently, like many military families. Bob Gingrich served in Korea and Vietnam during Newt’s childhood and adolescence, so Newt had a close bond to his mother. In early years, he also spent a lot of time with Newt McPherson’s sister Loma and her husband, and with his grandmother, a teacher, who taught toddler Newt how to read. In 1953, 10 year-old Newt loved reading and animals. He took a bus to Harrisburg, Pennsylvania to lobby the mayor to open a city zoo, for which he was written up in the local paper. In 1954, his father bought Newt an Encyclopedia Americana which he read night after night. In 1956, the Gingrich family moved to Europe — Orleans, France and Stuttgart, Germany, at the height of Cold War. In 1958, Newt had an “epiphany” at Verdun, France. At the age 15, he visited the battle site and says later this changed his life. It was at Verdun, that Newt Gingrich decided to become a politician who would prevent such carnage in the future. PARENTS – His father, Newton Searles McPherson, was born in Pennsylvania on February 24, 1923 and died in October of 1970. His mother, Kathleen Daugherty, was born in Enola, PA on November 20, 1925 and died in Harrisburg, PA, on September 23, 2003. His adopted father, Robert Bruce Gingrich, was born on July 22, 1925 and died on November 20, 1996. GRANDPARENTS – His paternal grandfather, Robert Nelson Kerstetter, was born in Milheim, PA on August 30, 1888. His paternal grandmother, Louise S. McPherson, was born in Pennsylvania on August 1, 1905. His maternal grandfather, Jacob Leroy Daugherty, was born in Pennsylvania around 1890. And his maternal grandmother, Ethel M. Hendricks, was born in Pennsylvania around 1896. GREAT-GRANDPARENTS – His great-grandparents were John H. Kerstetter, born in Pennsylvania on August 24, 1847, and Julia Kabel, born around 1849; Clarence Newton McPherson, born in Winfield, PA on August 16, 1872, and Hattie Treaster, born in Mifflin Co., PA in October of 1879; and Jeremiah H. Daugherty, born in Pennsylvania in December of 1859, and Rebecca J., born in Pennsylvania in November of 1852. Willard Mitt Romney was born in Detroit, Michigan, on March 12, 1947. He was the youngest child of George W. Romney, and Lenore Romney. His mother was a native of Logan, Utah, and his father was born in a Mormon colony in Chihuahua, Mexico. Mitt’s father, George Wilcken Romney was born to American parents in the Mormon colonies in Mexico, but events during the Mexican Revolution forced his family to move back to the United States when he was a child. Romney’s grandparents were polygamous Mormons who fled the United States with their children because of the federal government’s opposition to polygamy. His maternal grandfather was Helaman Pratt (1846–1909), who presided over the Mormon mission in Mexico City before moving to the state of Chihuahua and who was the son of original Mormon apostle Parley P. Pratt (1807–1857). Romney’s uncle Rey L. Pratt (1878–1931) would in the 1920s play a major role in the preservation and expansion of the Mormon presence in Mexico and in its introduction to South America. George Wilcken Romney’s parents were American citizens Gaskell Romney (1871–1955) and Anna Amelia Pratt (1876-1926). They married in 1895 in Mexico and lived in Colonia Dublán, Galeana, in the Mexican state of Chihuahua (one of the Mormon colonies in Mexico) where George was born on July 8, 1907. They are said to have practiced monogamy. George had three older brothers and would gain two more brothers and a sister. 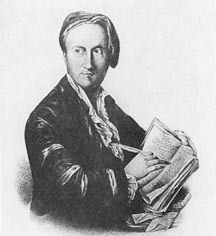 Gaskell Romney was a successful carpenter, house builder, and farmer who headed the most prosperous family in the colony. From here on, George Romney grew up in humble circumstances. The family subsisted with other Mormon refugees on government relief in El Paso, Texas for a few months before moving to Los Angeles, California, where the father worked as a carpenter. In kindergarten there, other children mocked Romney’s national origin by calling him “Mex”. This might explain how Mitt got his middle name, as the State of Michigan is shaped like a mitten. While a sophomore in high school, Mitt Romney participated in the campaign in which his father was elected Governor of Michigan. 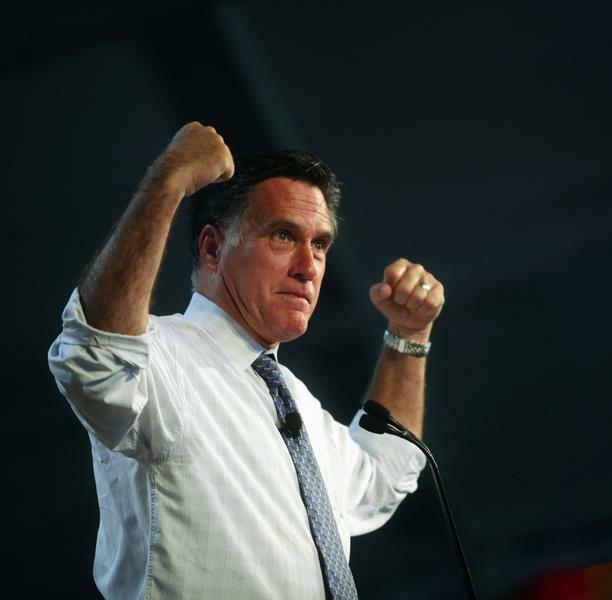 George Romney was re-elected twice, and Mitt worked for him as an intern in the governor’s office. He was also present at the 1964 Republican National Convention where his moderate father battled conservative party nominee Barry Goldwater over issues of civil rights and ideological extremism. PARENTS – His father, George Wilcken Romney, was born in Colonia Dublán, Galeana, Chihuahua, México, on July 8, 1907 and died in Bloomfield Hills, Michigan on July 26, 1995. His mother, Lenore LaFount, was born in Logan, Utah, on November 9, 1908 and died in Michigan on July 7 1998. GRANDPARENTS – His paternal grandfather, Gaskell Romney, was born in St. George, Utah on September 22, 1871. His paternal grandmother, Anna Amelia Pratt, was born in Salt Lake City, Utah on May 6, 1876. His maternal grandfather, Harold Arundel LaFount, was born in Birmingham, Warwick, UK on January 5, 1880. And his maternal grandmother, Alma Luella Robison, was born in Montpelier, Idaho on August 19, 1882. GREAT-GRANDPARENTS – His great-grandparents were Miles Park Romney, born in Nauvoo, IL on August 18, 1843, and Hannah Hood Hill, born in Tosoronto Township, Simcoe, Ontario on July 9, 1842; Helaman Pratt, born in a covered wagon during a one-hour stopover on the trail near Mt. Pisgah, Iowa on May 31, 1846, and Anna Johanna Dorothy (“Dora”) Wilcken, born in Dahme, Zarpin, Rheinfeld, Schleswig-Holstein, Germany on July 25, 1854; Robert Arthur LaFount, born in Belbroughton, Worcester, UK on March 9, 1856, and Emily Ethel Hewitt, born in Birmingham, Warwick, UK on January 19, 1861; and Charles Edward Robison, born in Nauvoo, IL on December 2, 1845, and Rosetta Mary Berry, born in Albion, Michigan on July 3, 1843. If I didn’t research this matter, I would not only be uninformed, but a hypocrite. Now at the time of Mitt Romney’s birth was his father a United States Citizen? Based on publicly available information, he certainly did not appear to be. Did George W. Romney, Mitt’s father, become a naturalized citizen prior to his son’s birth? If he did, that information is not in the public domain. What I do know is that many Mormons became Mexican citizens, that Mitt Romney has more than 20 distant relatives going back three generations living in the region of Mexico where his father, George, was born, and that as the son of a Mexican born parent, Mitt Romney is entitled to dual citizenship under Mexican law. On the other hand, Newt Gingrich was clearly born to parents who were citizens at the time of his birth. So in the absence of any evidence to the contrary, that’s all I need to know to sway my opinion. This is a list of the top four politicians on the list for impeachment or removal from office, and some of the reasons. There are many more reasons for removing these four from office, so feel free to add to the list. There are also many more politicians who should be removed, in fact, most of Washington DC should be purged. Snubbed Republicans during the passage of the Bailout Bill. She openly blamed President Bush for the financial crisis. Everyone knows that the financial crisis has roots going back to the 1970’s so to pass the blame solely on Bush was not only untrue, but unfair. Rammed the Stimulus Bill through without allowing anyone time to read it. Lied about her knowledge of the CIA’s enhanced interrogation practices, and stated that the CIA misled Congress for the past seven years. For his role in the botched oversight of Fannie Mae. Frank stated that there was no problem with Fannie Mae and that everything was just fine in the mortgage industry. About to authorize the funding of $8 billion to Acorn. When questioned, Frank simply states that President Bush gave Acorn $14 million over 8 years so Acorn must be a good organization. Ran a male prostitution ring from his DC apartment in 1989, was busted, but the Congress let him off the hook because he was deemed just a harmless weird gay guy. Has added nothing to decision-making regarding foreign policy (his alleged specialty), or in any area. Spilled national security secrets. He is a joke and a laughing stock. They are not gaffs, but rather the remarks of an incompetent, insensitive, and ignorant man. When something happens to Obama, Biden will not be capable of leading this country. Still hiding his original birth certificate and his college transcripts from the public. Circumstantial evidence proves that Obama probably got into college as a foreign student and received foreign aid just like his father. Not a Natural Born Citizen by virtue of his father’s nationality at the time of his birth. Obama was born with dual citizenship. Article II, Section I of the US Constitution states that only a Natural Born Citizen can occupy the office of the Presidency. Dismantled the US auto industry, violated the rights of secured creditors, quadrupled the National Debt in only 4 months, and threatens to bankrupt the United States.